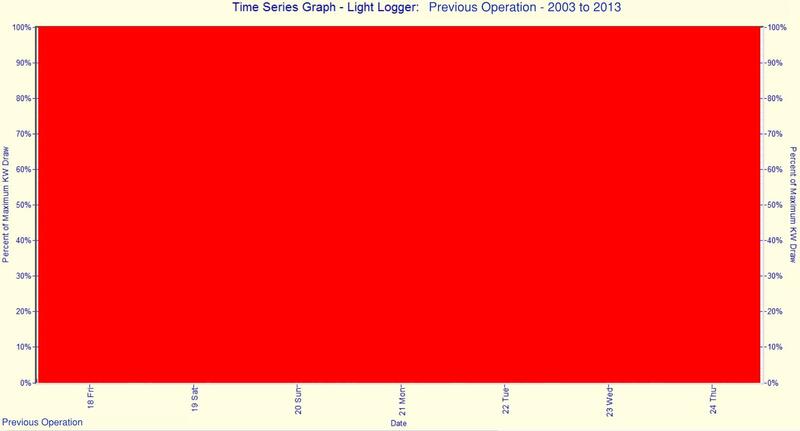 In my last lighting blog I promised to provide real data on real projects and I have one for you today. At Toronto General Hospital, Henry Gomolka (TGH’s lighting guru) has recently finished the installation of daylight and occupancy sensors in the in the lobbies of the Munk patient elevators (floor 3 to 12). These sensors will shut off the lights when the space is unoccupied or when there is sufficient daylight in the space. I’ll get to the details in a minute, but I want to share some of the results first. Also, if you want an introduction to the control types, I have a quick primer at the end. 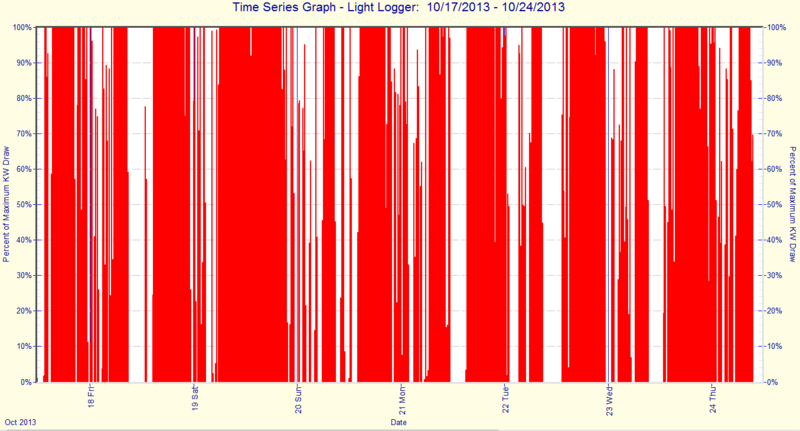 To get the results I setup a light logger to see how much energy we’re saving with the occupancy and daylight control. I don’t have a large sample size yet, only a week on one floor, but the data gives us an initial impression and shows encouraging results. Below I have a few graphs, the first showing the on and off times on the fourth floor with the occupancy and daylight sensors connected (white means lights are off, red means their on). The next graph is for illustrative purposes, to show what the profile looked like before. What we found was an energy savings of approximately 30% last week. Further, by reducing the time on, we also extend the life of the bulbs, thereby saving on disposal, new bulbs, and maintenance time. Retrofitting an existing space for new controls is typically more difficult than designing it in a new space because it requires wiring you don’t currently have. So in this application we used a new wireless sensor and control system from Lutron. It consists of battery powered occupancy and daylight sensors that communicate wirelessly with a ‘powerpack’ which turns the lights on and off. Note that three of the lights in each lobby are on emergency power, meaning they are not able to be shut off by code. So if you see them on, you’ll know why. The sensor batteries last for 10 years and have LEDs that flash red when they need to be changed. So far we found the system simple to install, relatively low cost, and functioning well. As a result we have begun to selectively expand to other areas of the hospital. The corridors between Munk and NU are underway; if you see Henry working there, please say hello. Occupancy and daylight control are becoming common practice in lighting today, but there are a few key considerations to getting it to work properly. Here’s a quick background to get you started; there’s a lot of good information on the internet so I won’t go into too much detail. Passive Infrared (PIR) sensors detect changes in the movement of heat in an area. These sensors operate on line of sight, and thus cannot see through solid surfaces (including glass). Ultrasonic sensors emit high frequency sound waves and then measure the time of response, which changes as a result of object moving in the space. The principle is similar to echolocation in bats. Daylight sensors – these sensors use a photocell to detect light levels in a space and can be setup to shut off your lights when sufficient daylight is available. They can also be setup to stop your lights from turning on in the morning. The different occupancy sensor types have different ranges, and each manufacturer and model is different. Generally though PIRs are best in smaller, enclosed spaces, such as private offices. Ultrasonic sensors are best in larger, open areas or spaces with obstacles (open offices and washrooms are good examples of each). There are also dual technology sensors that use both PIR and ultrasonic methods to compensate for each other’s weaknesses in certain applications. Daylight sensors also have range and sensitivity levels to consider. In the end you have to consider your application and review the options available (read the cut sheets for the sensors). Sensors will have specific fields of view, so you need to make sure they are oriented correctly and not blocked from sensing (e.g. a door, a bookcase, facing into a wall, etc). You may also need to adjust the sensitivity and timers. For occupancy sensors the sensitivity determines the range at which specific movement types are detected, and in daylight sensors it determines how much ambient light will trigger the sensor to turn off the lights. The timer sets the minimum amount of time that the light will be on following occupancy detection. The key here is, someone needs to set them up properly, or they won’t work. This entry was posted in Beyond Talkin' Trash, Energy Stories (powerful stuff), What We're Working On and tagged control, daylight, daylight control, daylight sensor, ECM, energy, Energy Savings, infrared sensors, lighting, occupancy sensor, Sustainability, Ultrasonic sensors. Bookmark the permalink.